ST-TFIM Tubular Fabric Inspection Machine is specially designed for easy and efficiency inspect to both sides of tubular fabric in single pass operation. ST-TFIM Tubular Fabirc Inspection is specially designed for easy and efficiency inspect to both sides of tubular fabric in single pass operation.The fabric is loaded and pass to the fabric checking box, through two mirrors, the operator can easily check both side of fabric. 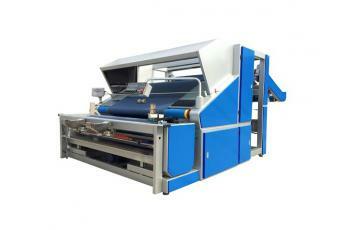 This machine can be supplied to operate fabrics from roll to roll or plait. or with various other fabric inlet and outlet options. Option 1: Suitable for Tubular Fabric Inspection from Roll to Roll. Option 2: Suitable for Tubular Fabric Inspection from Roll to Roll/Plait. 1). Fabric rolling drawer, with upper delivery mode lessen fabric tension and more convenient for inspection. 2). The inspecting speed controlled by inverter as requirement. 3). High voltage dispenser for lightening system. This special device provides electricity Power to the Fabric Checking Box wireless. 4). Multi-size inspecting lightening cabinets from width 18”～50” for requirements of various fabric. This special Box installed Magnetic Block in the bottom to suspension automatically against the roller to eliminate crease marks to fabric. Only few push buttons to run the machine smoothly.